There's little doubt that the PCStats Forums are one of the friendliest places on the web to chat, whether you're an experienced Liquid Nitrogen cooling guru, or complete tech newbie. If you have questions, you'll find the answers in the PCStats Forums! Of course there's more to life than computers, members are more than welcome to discuss pretty much anything from sports to their favorite tunes. If you feel like blowing off a bit of steam, visit the no-holds-barred Free For All forum! Computer geeks like myself, are going to enjoy PCstats forums hardware sections where you can discuss anything from videocards to motherboards, processors and definitely overclocking!! Benchmark enthusiasts are welcome in the PCStats 3DMark Team\Other Benchmarks area, and those of you who like a good deal, will absolutely love PCStats Web Deals forum. 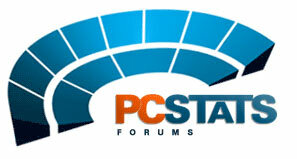 PCStats forums Beginners Questions and Answers 101 should be able to guide you through any problems you might have. Our members are among the smartest on the web, and willing to help. On that note, if you think you've missed a PCStats Newsletter Weekly Tech Tip, check out the Newsletter Tip Archive. The best OS/Hardware tweaks on the web are found there, and I'm sure it will help you boost your system performance!